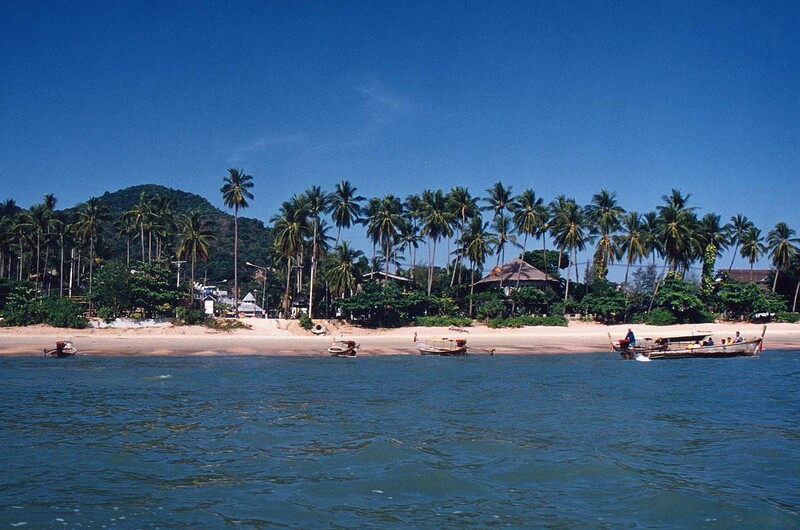 So we arrived on the west coast of Thailand’s southern area, this province has became quite popular for tourists destination ever since they opened their own airport for both domestic and international flights. This airport is connecting Krabi with 18 direct flights from Asian and Australian cities today*. 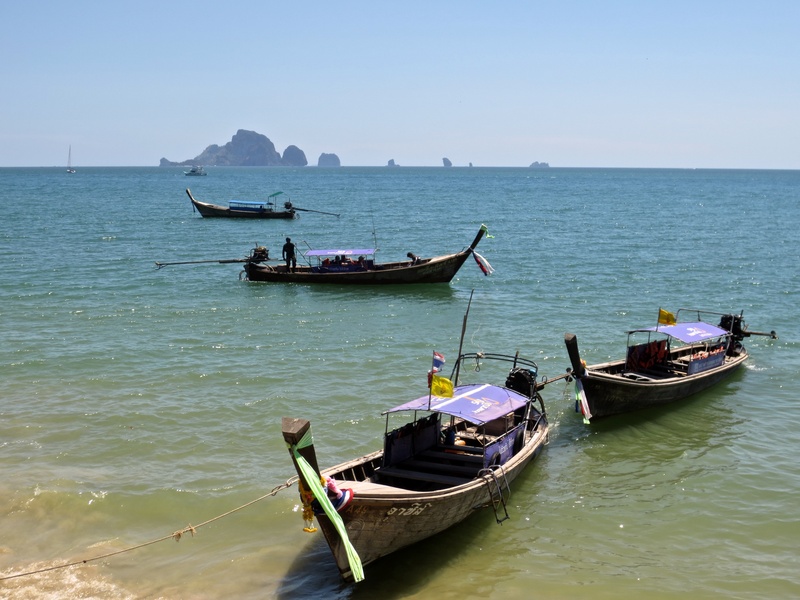 Famous for its natural beauty, Krabi is literally a paradise for those attracted to the tropical island life. There are more than a hundred islands nearby with white sandy beaches, clear blue sea, fascinating corals and creatures under the water. 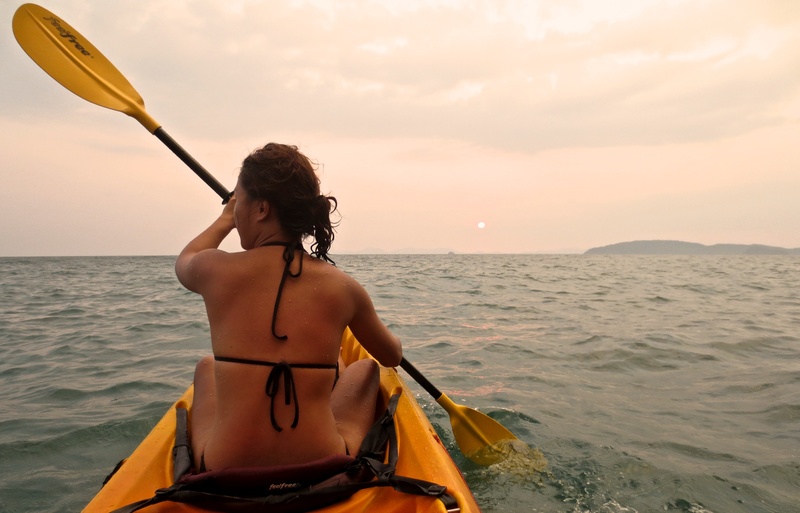 But it’s not only these; Krabi has a little something for everyone, you will never run out of things to do. From tours around the islands, snorkeling, diving, kayaking, to land activities like rock climbings, off-road adventure, cycling trips and even jewelry making workshops. I was still a little bit jet-lagged, but also curious for the neighboring small islands. The next day we decided to start with relaxing island hopping to the four closest islands. 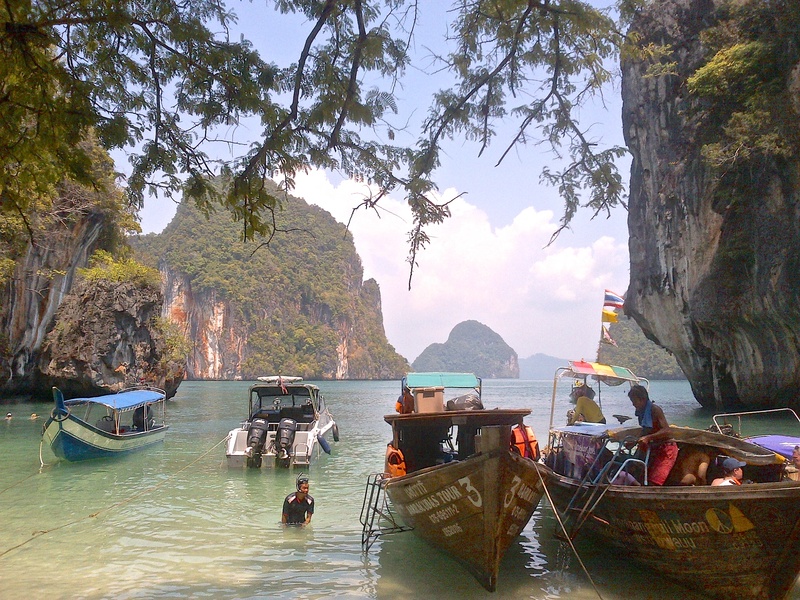 We were all gathered at Ao Nang, a coastline that’s also the tourist central of Krabi. We departed from the pier by 9:30am on the much applauded longtail boat of Thailand. 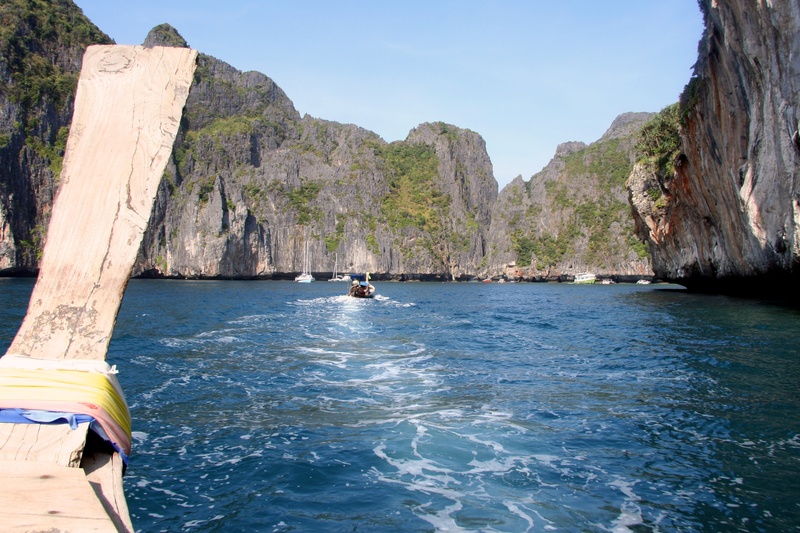 The four islands close-by are Koh Gai (chicken island, named simply because it is shaped like a chicken), Koh Tup, Koh Poda and Phra Nang Cave. Koh Poda was our first stop. The view surrounding this island was astounding. Limestone mountains, white sand beach, crystal clear water with a lot of fish inside, also the beautiful corals and reefs, it was just amazing. We snorkeled more at the chicken island. During low tide, the sand bar are raised and connected between chicken and Tup island, making it possible to walk to either one of them. Last but not least was the Phra Nang Cave, a cave that’s well-known for its many stalagtites and stalagmites. The cave is also a sacred place for the sea gypsies in the area, you can see many shrines around. 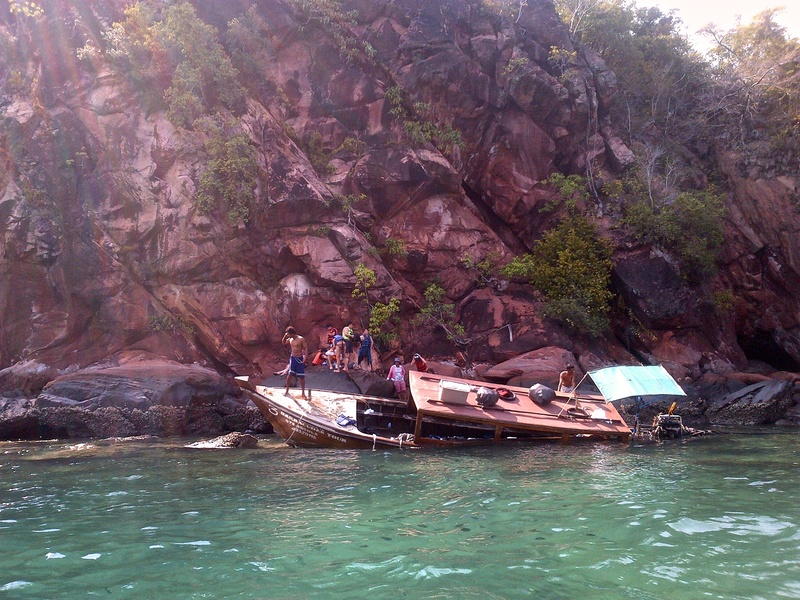 Unfortunately on the way back to Ao Nang, we had to witness a sinking boat with more than 20 people on. Apparently the longtail boat hit a big rock. Our boat had to stop and help, we took half of the people from the sinking boat into our boat while the rest of them were trying to grab a safe ground on the rocks. I’m glad nobody was injured. We came back later than we expected, though overall it was a pleasant trip. The white sandy beaches were charming and relaxing enough despite the little accident that happened on the way back. From this we learned that when the travel industry is booming, safety and security may not follow the trend. So make sure to book from eOasia, we struggle and search for reliable operators. It’s not the best deal, it’s quality and well-structured company that matter. * Krabi Airport offers today direct flights to 18 cities in Asia and Australia. Around 16 airlines operate out of Krabi Airport. Every week, at least 217 domestic flights and 91 international flights depart from Krabi Airport.